The book gives an in-depth study of the principles of the spread spectrum techniques and their applications in mobile communications. 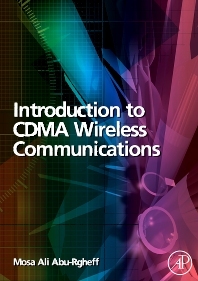 It starts with solid foundations in the digital communications that are essential to unequivocal understanding of the CDMA technology, and guides the reader through the fundamentals and characteristics of cellular CDMA communications. A very clear and thorough description of the principles and applications of spread spectrum techniques in multi-user mobile communications. Matlab-based worked examples, exercises and practical sessions to clearly explain the theoretical concepts. An easy-to-read explanation of the air interface standards used in IS-95 A/B, cdma2000, and 3G WCDMA. Clear presentations of the high speed downlink and uplink packet access (HSDPA/HSUPA) techniques used in 3G WCDMA. The book is a very suitable introduction to the principles of CDMA communications for senior undergraduate and graduate students, as well researchers and engineers in industry who are looking to develop their expertise. Senior undergraduate and research students, engineers working in industry.